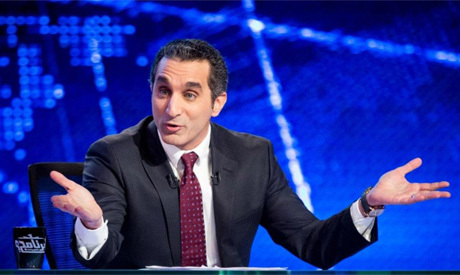 Egypt’s prosecutor-general has ordered an investigation into lawsuits filed against prominent TV satirist Bassem Youssef for allegedly insulting President Mohamed Morsi in the last episode of his weekly political satire show El-Bernameg (The Programme). During the last episode, aired on privately-owned channel CBC on Friday, Youssef mocked the president’s latest public interview. The lawsuit was filed by 12 citizens, according to Ahram's Arabic news website. In January, a number of Islamist lawyers also filed a lawsuit against Youssef, accusing him of "undermining the standing of the president" during his show. However, charges were dropped before the case reached court. Several similar lawsuits have been filed against media figures on charges of insulting the president, including against psychiatrist Manal Omar, journalist Abdel Haleem Qandil and TV host Mahmoud Saad, although none of the three were convicted. However, rightwing television personality Tawfiq Okasha was sentenced to four months in prison in October on charges of insulting the president. According to Gamal Eid, human rights lawyer and executive director of the Arab Network for Human Rights Information (ANHRI), the number of 'insulting the president' lawsuits filed in the first 100 days of Morsi being in office was four times greater than those filed during the entire 30-year rule of ousted president Hosni Mubarak. Most of the complaints filed since Morsi became president were submitted by private citizens, not by the office of the president, according to an ANHRI report. Friday evening is the only chance for some us to relax and have a laugh, often at ourselves, not just at Morsi and other such figures. Bassem is one of the funniest and smartest comedians/satirists, I have seen anywhere in the world. He is not just admired within Egypt and the Arab World, but he has a following in the West too, due to popular demand, many of his shows are uploaded with English subtitles. If Bassem is ever arrested, and I strongly doubt it, millions will take to the streets, and fans from outside will also, fly in to support him! So beware,if anyone is contemplating taking this further, please think again!